Welcome to Massage By Megan, LLC. My name is Megan Woodall and I have been a licensed massage therapist for the state of NC (license number 13193) for almost 4 years. I graduated with honors from Living Arts Institute in Winston-Salem with over 800 hours of hands on training. I specialize in Swedish, Deep Tissue and Sports Massage. 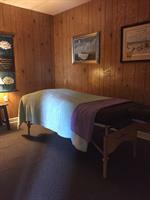 I am also trained in pregnancy massage, stretching, aromatherapy facial massage, foot reflexology and more. Each session is customized to fit the need of the individual client. No massage session is the same. Whether it is to focus on and release muscles tension from certain muscle groups or single muscles or if you are just needing to relax, Massage By Megan is the place to come!